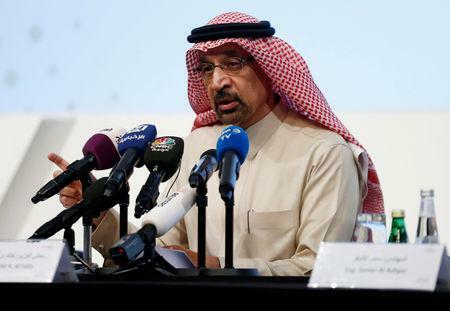 LONDON (Reuters) - Saudi Arabia plans to produce around 9.8 million barrels per day of oil in March, over half a million bpd below its pledged production level under a global supply-cutting deal, Energy Minister Khalid al-Falih told the Financial Times. Exports would fall in March to 6.9 million bpd, according to the article published on Tuesday. The March production figure means Saudi would be voluntarily cutting output by more than 500,000 bpd below its pledged production level under a deal between the Organization of the Petroleum Exporting Countries and allies led by Russia. The news boosted Brent crude prices by more than 2 percent to nearly $63 a barrel. Production in March would be 1.2 million bpd lower than Saudi Arabia's November output, which was an all-time high. In the interview, Falih addressed a U.S. bill that might expose OPEC to antitrust lawsuits, saying the legislation could be "harmful" to the global economy, and expressed his hope that the United States would "do the right thing". He said if Saudi Arabia were unable to balance the market by adjusting production, the world would suffer "irreparably". A U.S. House of Representatives committee approved the bill known as No Oil Producing and Exporting Cartels Act, or NOPEC, last week.